Custard is one of the first dishes I learned to prepare on my own.Whenever there was an excess of milk packets in the fridge,I offered to make custard.Off we went to the bakery opposite our house and got a packet of Glaced cherries,by which time amma would have sliced and refrigerated a bowl of cut fruits and then started the wait for the custard to cool down and then relish.We also eagerly waited for our turn to lick the bowl and spoons clean!! I hadn't made Custard in ages,don't know why.Sometimes,the simplest of things taste so good that I feel I do not have to think of anything else as a dessert during parties.But then,we want variety,at least while serving others,if not for ourselves.Though on second thoughts,I don't think anyone dislikes custard. 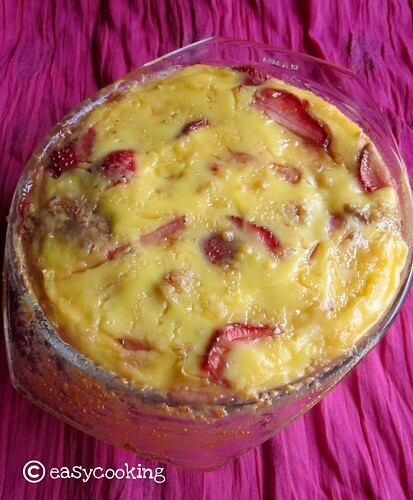 When I saw this Bread and Butter pudding on Anushruti's blog,I knew I would try it immediately.What was there not to love about it?It is the season for Strawberries here,though a bit expensive but pretty and tasty nevertheless.I had some brown bread in the fridge and I set out making this last weekend.I skipped the nuts and halved the bread slices,as we like more custard coating the bread slices.Served warm,straight out of the oven,this made for a delicious dessert.I had it cold from the fridge and it didn't disappoint either,lovely!! Preheat the oven to 190C/350 F.
Brush an 8” round oven proof pan with the butter and sprinkle with 1 tbsp demerara sugar all over it. In a small bowl, put in the custard powder and mix with a little milk (1/4 cup) to form a smooth paste. Heat the remaining milk with the sugar on a medium flame until the sugar melts. Lower the flame and slowly mix in the prepared custard paste and cook until thick and smooth and the liquid coats the back of a spoon, about 2 to 3 minutes. Keep aside. Place these bread cubes in a large bowl and mix in the strawberries. Pour in the prepared custard and toss to coat. Pour the bread, berries and custard mixture into the prepared baking dish. Sprinkle with the remaining demerara sugar and cover the dish with aluminium foil. After about 20 minutes, rotate the dish and remove the foil. Bake until the top is crisp and toasted, about 20 minutes or more. Allow the pudding to rest, for about 15 minutes and serve warm. If cool, reheat for about 10 minutes at 325F/160C before serving. Makes one 8″ round pudding, which would make 4 to 6 servings. Off this goes to Ally's event Delicious Desserts! 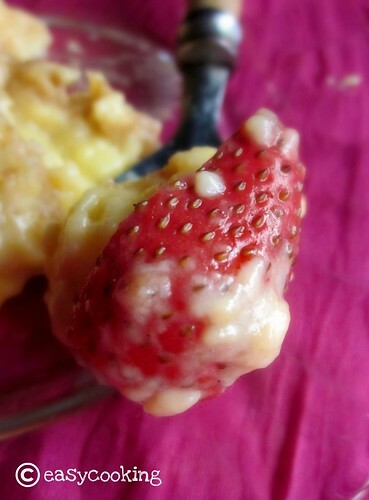 I have not made custard for ages too and this combo looks so so creamy delish. they look super delicious--finger licking good ! Thats looks like a delicious pudding,perfect dessert! I love custard too! It's such a comfort food...isnt it? Glad you enjoyed this! i agree with you on the custard and ir could simply make your day!! Great entry. Thanks a ton!!! I love bread pudding and this is so much more than that, very nice. 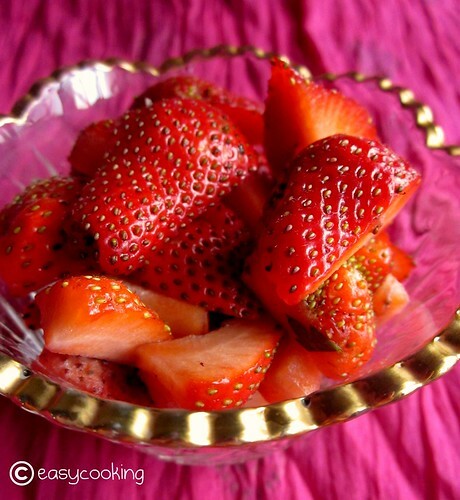 I guess, you can also send it to Veggie/Fruit A Month - Strawberry event held @ Pari's Blog Foodelicious. 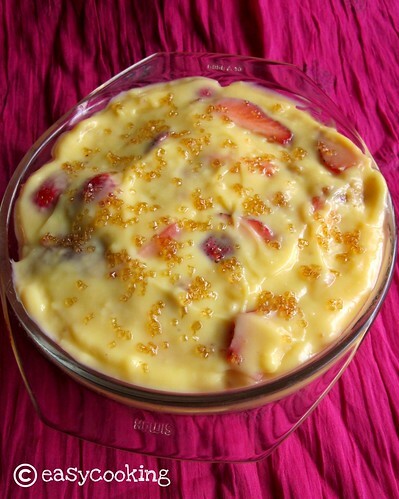 We would make custard after festivals when we would be left with loads of fruits. And this would a delicious way to finish them. I really haven't made custard in ages, this is easy and quick! U have an award waiting in my blog.